An Earthlike moon orbiting a gas giant host planet. A single gas giant planet in the not-too-warm, not-too-cold habitable zone around its star — where Earth and Mars correspondingly reside — could host several livable moons. At this early point in our hunt for exoplanets, most of the worlds we have found in the habitable zone are giants, not Earths. It's possible that the first inhabited place we discover outside our Solar System will be a moon. A new paper by Heller and his colleague Rory Barnes of the University of Washington and the NASA Virtual Planetary Laboratory examines how heat emanating from a freshly formed exoplanet, coupled with irradiation from the solar system's star, can roast the planet's moons. Before the planet cools off sufficiently, its close-orbiting moons could lose all their water, leaving them bone-dry and barren. "An exomoon's habitability is of course constrained by its location in the stellar habitable zone, but it also has a second heat source — its host planet — that has to be accounted for," said Heller, whose paper has been accepted for publication in The International Journal of Astrobiology. "With regard to this second source, our study shows that at close range, the illumination from young and hot giant planets can render their moons uninhabitable." Researchers believe moons could serve as suitable abodes for life just as well as planets. Even moons far beyond the habitable zone, such as Jupiter's Europa and Saturn's Titan, offer tantalizing hints of potential habitability thanks to the subsurface ocean in the former and the intriguing organic chemistry of the latter. Still, a moon around an exoplanet in the habitable zone stands as a far better bet for life than these frigid candidates. Heller's findings suggest that we ought to exercise caution, however, before declaring that an Earth-sized, habitable-zone exomoon is a real-life Pandora — the lush moon of science fiction fame in "Avatar." Before assuming an exomoon is habitable based on its host planet's locale, the moon's current and conjectured past orbital distances will need to be assessed. "Earth-size exomoons that could soon be detected by our telescopes might have been desiccated shortly after formation and still be dry today," said Heller. "In evaluating a moon's habitability, it is crucial to consider its history together with that of its host planet." A brood of planets comes into being around a star, forming piecemeal from the collision of ever-growing chunks of material. Most moons are thought to originate in a similar manner around their host planets. Where a moon sets up shop around its planet influences the chances of hanging onto any initial water and allowing life a chance without relying upon the fortune of future cometary water. According to formation models, significantly sized satellites should form between about five and 30 planetary radii, or half-planet widths, from their host planet. Jupiter's four biggest moons, dubbed the Galilean moons, fit this profile: Io orbits at 6.1 Jupiter radii; Europa, 9.7; Ganymede, 15.5; and Callisto squeaks in at 27 Jupiter radii. The biggest moon of Saturn, Titan, makes its home at a distance at of 21.3 Saturn radii. An artist's impression of lightning streaking toward the ultra-hot and utterly desiccated surface of Venus. The planet, Earth-like in mass and size, likely lost its primordial water through a runaway greenhouse effect. Raising the temperature on a watery world can trigger what is known as a runaway greenhouse effect. Water evaporates because of heat. Resulting water vapor is particularly good at trapping heat. In a positive feedback loop, this trapped heat can lead to evaporation of water at a faster rate than cooling, and condensation can restore it back to liquid form. Over time, a world's entire water supply can end up as a hot gas. This gas is broken down by sunlight into constituent oxygen and hydrogen. The latter, the lightest element, can escape off into space, and the world becomes desiccated. Orbits, however, are not fixed things. Where a moon orbits today might not be where it initially formed and existed for many millions of years. The tidal forces just mentioned usually work to slowly push a moon out to a wider orbit over time. Thus, the observed location of moons today must be taken with a grain of salt—though appearing "safe" now, their pasts could have left them parched. This mass habitability cutoff point is thought to be at least that of Mars, or 10 percent of Earth's mass. For comparison, the biggest moon in our solar system, Ganymede, is a measly one-fortieth of Earth's mass. That said, various studies have indicated that gas giant planets much bigger than Jupiter should spawn comparatively super-sized satellites. The researchers accordingly went with a "monster" Jupiter, a Jovian planet 13 times Jupiter's mass, as their model host planet. A 13-mass Jupiter is about as massive as a planet can get, scientists think, before entering into brown dwarf or "failed star" territory; in such a case, the planet would emit way too much heat for most exomoons to ever have a prayer of being habitable. As for hypothetical test moons in the study, Heller and Barnes went with two: an Earth twin, with the same rockiness and mass, and a "super-Ganymede," an icy body with a quarter of Earth's mass. Heller and Barnes then placed these planet-and-moon duos in their model at two different orbital distances from a sunlike star. The first location approximated Earth's, about 93 million miles away, considered toward the hotter end of a sunlike star's habitable zone. The second spot was 1.7 times farther away, somewhat past the orbit of Mars, taken here as the outer limit of the habitable zone. A final numerical consideration was the age of the planet-moon system. Younger giant planets emit more heat than older, cooled-off versions of themselves. So, three ages were picked: 100 million, 500 million and 1 billion years, with the last representing a fairly evolved system. Now, with all these parameters in place, Heller and Barnes plugged in the critical variable of the hypothetical moons' orbital distance from host planets. For both styles of moon, Earth-like and super-Ganymede-esque, an orbital distance of 10 Jupiter radii or less would be bad news for life. A runaway greenhouse effect would commence based on the host planet's illumination alone for around 200 million years—a fairly decent span of geological time, and certainly long enough to thoroughly dry out the moon. Add in the sun's rays, and the water-vaporizing interval on the Earth-like moon lasts for 500 million years. For the super-Ganymede, it's 600 million. Comets rain down on a young, rocky world in this artist's impression of the Late Heavy Bombardment, a theorized period of intense impact activity on Earth approximately four billion years ago. Bump the hypothetical moon distance from its host to a roomier 15 Jupiter radii and the picture still doesn't improve much; 200 million-plus years or so of moon-cooking still ensues. Out at 20 Jupiter radii, the Earthlike moon is spared a runaway greenhouse effect, but the super-Ganymede still suffers out-of-control heating for a similar couple hundred million year span. "The thermal irradiation from a super-Jupiter host planet can clearly have a major influence on the habitability of its moons," said Heller. "Depending on the planet's mass and the history of its luminosity, any exomoon discovered today would need to have had a sufficiently wide orbit to have avoided desiccation in the far past." For an arid moon, however, its chances of bringing forth life might not be lost forever. Due to gravitational perturbations, it could migrate beyond the habitable edge. Once there, out of the death zone, icy comets pummeling it could deliver vast stores of water after the runaway greenhouse effect has slackened. A cometary bombardment is similarly thought to have deluged Earth several million years after its molten exterior cooled to a hard crust, giving rise to our planet's life-permitting oceans. 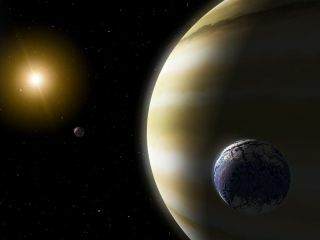 So, the overall message of Heller's newest study is that Earth-like exomoons' pasts cannot be ignored. When these worlds are identified, it will be necessary to perform orbital simulations on them to try to glean their histories. The orbital evolution models will be complex, accounting for tidal effects between the planet and the moon, as well as the gravitational perturbations between the moon, other moons, the planet, and the star. Coupled with models of planetary formation and cooling, astrobiologists can hopefully better estimate an exomoon's current habitability. Said Heller: "It's important that we do our best to look deep into an exomoon's past in order to better understand whether it can possibly support extraterrestrial life."